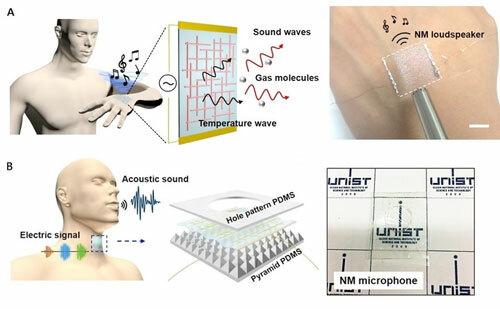 (Nanowerk News) An international team of researchers, affiliated with Ulsan National Institute of Science and Technology (UNIST) has presented an innovative wearable technology that will turn your skin into a loudspeaker. 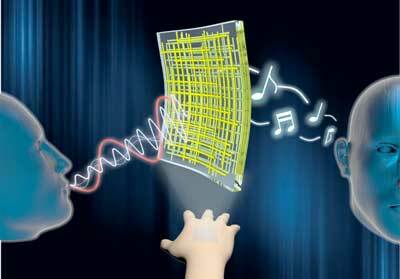 In the study (Science Advances, "Transparent and conductive nanomembranes with orthogonal silver nanowire arrays for skin-attachable loudspeakers and microphones"), the research team has developed ultrathin, transparent, and conductive hybrid nanomembranes with nanoscale thickness, consisting of an orthogonal silver nanowire array embedded in a polymer matrix. They, then, demonstrated their nanomembrane by making it into a loudspeaker that can be attached to almost anything to produce sounds. The researchers also introduced a similar device, acting as a microphone, which can be connected to smartphones and computers to unlock voice-activated security systems. Their ultrathin, conductive, and transparent hybrid nanomembranes can be applied to the fabrication of skin-attachable NM loudspeakers and voice-recognition microphones, which would be unobtrusive in appearance due to their excellent transparency and conformal contact capability. "Our ultrathin, transparent, and conductive hybrid NMs facilitate conformal contact with curvilinear and dynamic surfaces without any cracking or rupture," says Saewon Kang in the doctroral program of Energy and Chemical Engineering at UNIST, the first author of the study. He adds, "These layers are capable of detecting sounds and vocal vibrations produced by the triboelectric voltage signals corresponding to sounds, which could be further explored for various potential applications, such as sound input/output devices." Paper-thin stick-on speakers, developed by Professor Hyunhyub Ko and his research team at UNIST. "The biggest breakthrough of our research is the development of ultrathin, transparent, and conductive hybrid nanomembranes with nanoscale thickness, less than 100 nanometers," says Professor Ko. "These outstanding optical, electrical, and mechanical properties of nanomembranes enable the demonstration of skin-attachable and imperceptible loudspeaker and microphone." Wearable microphones are sensors, attached to a speaker's neck to even sense the vibration of the vocal folds. This sensor operates by converting the frictional force generated by the oscillation of the transparent conductive nanofiber into electric energy. For the operation of the microphone, the hybrid nanomembrane is inserted between elastic films with tiny patterns to precisely detect the sound and the vibration of the vocal cords based on a triboelectric voltage that results from the contact with the elastic films. "For the commercial applications, the mechanical durability of nanomebranes and the performance of loudspeaker and microphone should be improved further," says Professor Ko.